CAT 5 single RJ45 socket for your computer network. CAT 5e twin RJ45 socket, for your computer network. CAT 5e computer network cable, sold by the metre. Buy as much as you like (up to 300m) and get it all in one big length. This is the solid core stuff for permanent wiring - not suitable for making patch leads. 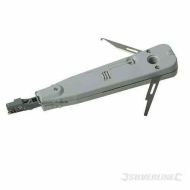 IDC punch down insertion tool. Krone type tool for insulation displacement connectors.